As we approach the end of the Pride season have you noticed how many unicorns you’ve seen? Unicorns seem to be everywhere. Amongst my other interests I’m a cryptozoologist and understand why members of the lgbt community feel some affinity with such fabulous creatures. After all, some people claim we don’t exist. A cryptozoologist is someone who studies fabulous beasts, mythical creatures and strange animals. Yes, we’re talking about Yeti, Nessie and fairies. Until very recently I wasn’t really aware of any other lgbt cryptozoologist. The more open lgbt cryptozoologists on the internet seem to be of a younger generation than myself. Gay Star News published a feature on the current fascination for unicorns and the people who look for weird creatures and cryptids. Cryptid is the all-encompassing name for these creatures. The words cryptid and cryptozoology indicate their mysterious nature. Their apparent strangeness and “otherness” has been mirrored over many centuries in the attitudes of society with regard to homosexuality and gender identity. They are seen as being outside conformity and the normal understanding of the world, just like many members of the lgbt community feel. Included by many cryptozoologists, myself one of them, are heraldic beasts, my specialist area. Many of these beasts are common to myths and legends – the unicorn, griffin, mermaid, etc. Some heraldic beasts are very real. The female pelican, for example, had the legendary trait of pecking at her chest so her chicks could feed on her blood. This blood-letting is shown often in heraldry and I’ve illustrated it a couple of years ago in the coats of arms of two lgbt people, Julia Pell and Lord Arthur Pelham-Clinton. In the 1990s I designed and sold badges which featured heraldic beasts (below). 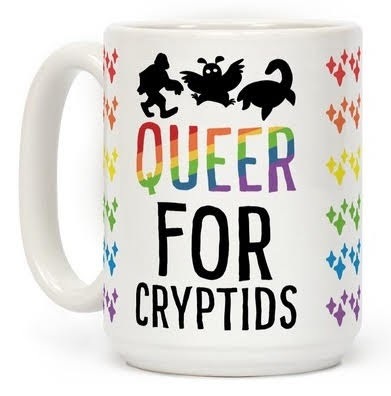 In view of the growing popularity of cryptids in the lgbt community, not to mention the world of Harry Potter and his Fabulous Beasts, I may redesign them and start selling them again (they've all been copyrighted to myself, by the way, and I do not give permission for them to be reproduced). I adopted one heraldic beast as a personal mascot, a rare beast called an alphyn (seen on the bottom row of badge designs). I chose it because its name is similar to that of my grandmother’s family, who spelt their name Alphey in Tudor times. Just like the pelican of the Pelham and Pell families, people and places adopting beasts with similar names is common in heraldry. The London borough of Enfield shows the heraldic beast called the enfield on most of the street signs. As well as the composite animal cryptids like the unicorn, griffin and alphyn, who are made up of body parts from different animals, there are also the humanoid cryptids. The most well-known of these is the mermaid. Today the term mermaid has been used to describe many water spirits and creatures. Sirens, tritons, naiads and many others have been depicted as half-human and half-fish, personified in recent popular culture by Ariel from Disney’s “The Little Mermaid”. There’s so much to say about mermaids and the lgbt community that I’m going to leave them for separate article next month entitled “My Ancestor was a Mermaid”. All through history people have been catching glimpses of strange, unknown creatures. Legends and stories have developed around them, trying to explain their origin. Remote locations have always been ripe for sightings of cryptids. In ancient Greece many myths and legends were told about strange creatures and societies living near the edges or dark places of their world. Medusa, the Harpies and the Cyclops are still familiar cryptids. One of the lesser know cryptids is a race of being called the Makhlyes. The Greek historian Herodotus, writing 2,500 years ago, described this race of north African humanoids as being sexually divided down the middle of their bodies, one side being male and other female. Medieval explorers wrote down what unfamiliar creatures they saw and medieval writers collected all those stories together into books called bestiaries. Familiar creatures, like the pelican, were included. Another creature that is familiar to us today but rarely seen by the majority of Europeans at the time was a creature called the cameleopard. It was a cross between a camel and a leopard. Today we call it a giraffe. Perhaps, one day, we’ll discover the reality behind some cryptids. Perhaps we’ll find the real Nessie and discover if it really is a plesiosaur. Or perhaps we’ll find out if Bigfoot and Yeti are the same species. Theories about Bigfoot have been very popular and lots of books have been written about it. Michael Grumley (1942-1988), was a gay writer who, with his partner Robert Ferro and their friends, formed an informal group known as the Violet Quill. Members of this group were responsible for the renaissance of gay literature after the 1969 Stonewall Riots. In “There Are Giants in the Earth” published in 1974 Michael Grumley suggested that Bigfoot and similar humanoid cryptids are the last remaining members of a species of giant which once populated Earth. They now are very few in number and live in isolated caves and underground tunnels. 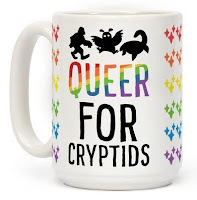 As my interest in cryptozoology has been rekindled in the past few weeks I wonder if there are any more cryptids that will become lgbt icons and mascots. In the USA the legendary Mothman and the less well-known Flatwoods Monster have been adopted by some lgbt people. With so many genders and sexual identities being recognised and brought into the open perhaps there’s room for everyone to have their own personal cryptid mascot.